This webinar will cover the basics of today’s television transmitters. The focus will be on digital transmitters with the digital age essentially mature. While many transmitters deployed in the digital conversion were solid state, many were constructed with inductive output tubes (IOTs). Several of the IOTs are now being replaced due to repack but several remain in service. We’ll cover both solid state and IOT transmitters, their key building blocks and their key items of maintenance. Joe Seccia is principal architect for the product management group of TV transmission products area at GatesAir. Joe received his B.S. in electrical engineering from Michigan Technological University in 1990 and his M.S. in electrical engineering from National Technological University in 1997. Since joining GatesAir, formerly Harris Corporation’s Broadcast Division, in 1990, Joe has held positions of increasing and varied capacity within GatesAir’s engineering and product management groups including solid-state amplifier design and digital signal processing. Joe has been a key part of GatesAir’s digital television development beginning in 1995, most recently leading GatesAir’s technology evolutions in software configurable exciters that support all popular worldwide DTV standards as well as high efficiency transmitter platforms. Joe is an active participant in ATSC activities and is a 32-year member of the IEEE. Joe is a registered professional engineer in Michigan and holds five U.S. patents. The completion of this webinar from Webinars by SBE qualifies for 1 credit, identified under Category I of the Recertification Schedule for SBE Certifications. Registration for each module will be done separately. Click Register Now below, to register for Module 3. SBE MemberPlus members - when registering, be sure to click on the MemberPlus link to activate your MemberPlus benefit to register for free. Not a SBE MemberPlus member? For more information, see below. If you have questions regarding this webinar, contact Cathy Orosz via email or by phone at 317-846-9000. The RF 201 series, like all new SBE webinars presented in 2019, are included at no additional cost for members who renew or join using the $175 SBE MemberPlus membership option. You get all RF 201 modules, plus access to all archived SBE webinars and any new live webinars SBE presents through March 31, 2019, all for no extra cost. Members can renew and newcomers may join online at the SBE website using the SBE MemberPlus option. 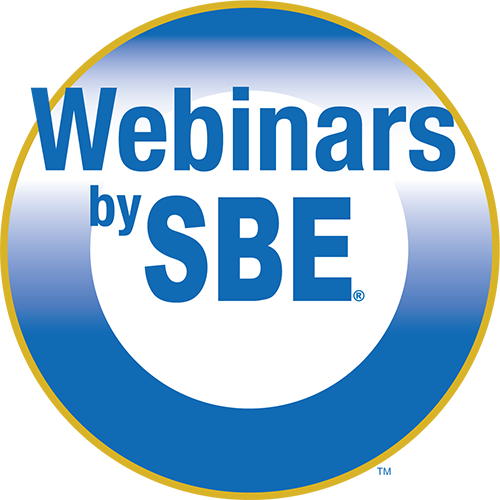 Access to the SBE webinars through the SBE MemberPlus program is limited to the MemberPlus-purchaser only. You are not permitted to distribute, sell, copy, share, project or otherwise make the webinars available to any other individual or group without express written permission by the SBE.